The vehicles of the Star Wars saga are nearly as iconic as the heroes and villains spread across the galaxy. Vehicles like the Millennium Falcon and Black One reflect their owners—and with modifications like smuggling compartments in an inconspicuous freighter, a loyal R2 unit to keep your ship in the sky, or a little additional firepower on your landspeeder, you can craft the perfect vessel to take you across the galaxy. In the game, mods are essentially upgrades for your supports, letting you roll out multiple dice or providing other abilities when you activate the attached card. In Across the Galaxy, mods are exclusively attached to vehicles, letting you customize some of the most famous ships in the Star Wars saga! 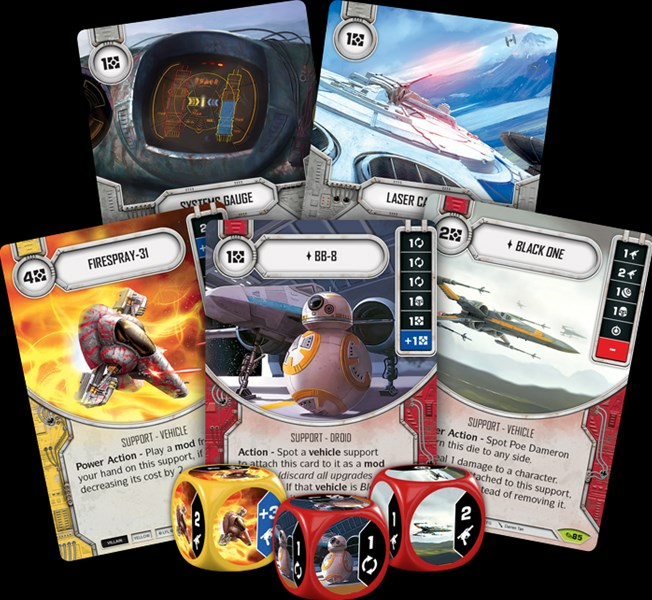 Join us today as we preview vehicles and mods in Across the Galaxy, the newest set of boosters for Star Wars™: Destiny!